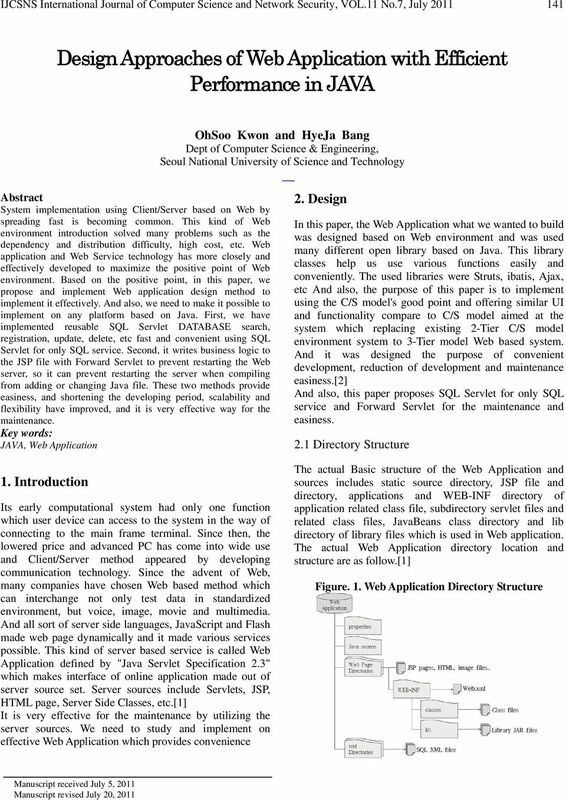 Download "Design Approaches of Web Application with Efficient Performance in JAVA"
3 IJCSNS International Journal of Computer Science and Network Security, VOL.11 No.7, July from XML directory using XML Controller. Figure 4. Web Application Client process flow diagram time. It processes in database by reading from XML document using each separated SQL ID and responds it by making XML format data. Then it doesn't add and create servlet anymore for the database process, and the service can be used by adding SQL DML statement in XML document, and it has an advantage of using service by adding SQL DML statement to the XML document. And also, it gives effective development of convenience. SQL servlet process flow diagram shows as follows. Figure 6. 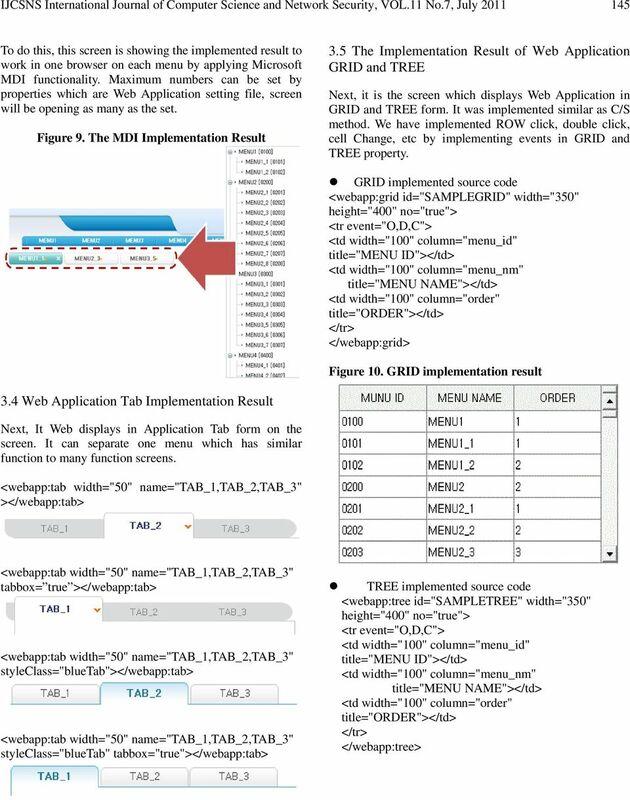 Web Application Compile Process Flow Figure 5. 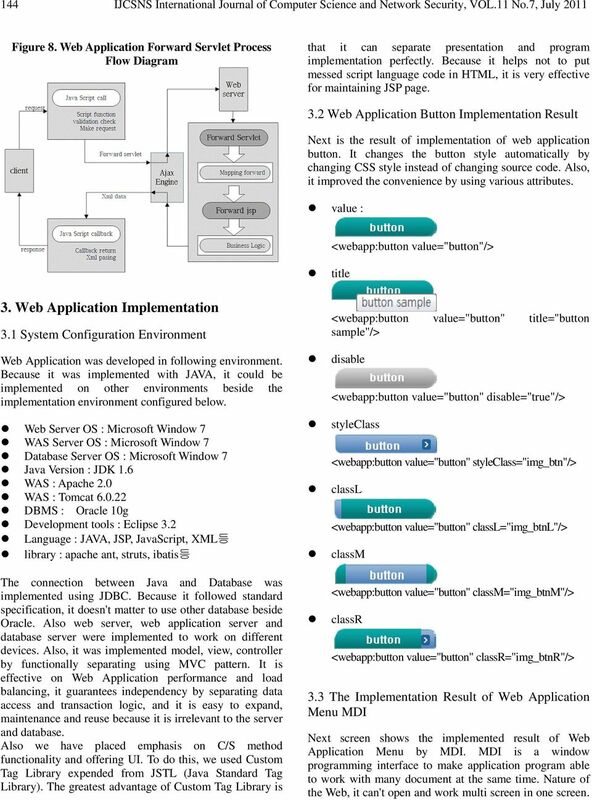 Web Application Web Server Process Flow Figure 7. 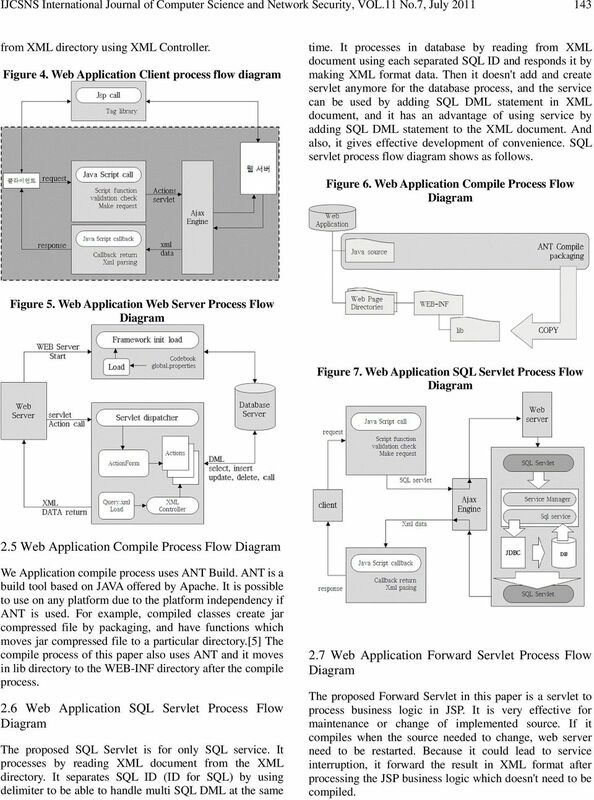 Web Application SQL Servlet Process Flow 2.5 Web Application Compile Process Flow We Application compile process uses ANT Build. ANT is a build tool based on JAVA offered by Apache. It is possible to use on any platform due to the platform independency if ANT is used. For example, compiled classes create jar compressed file by packaging, and have functions which moves jar compressed file to a particular directory. 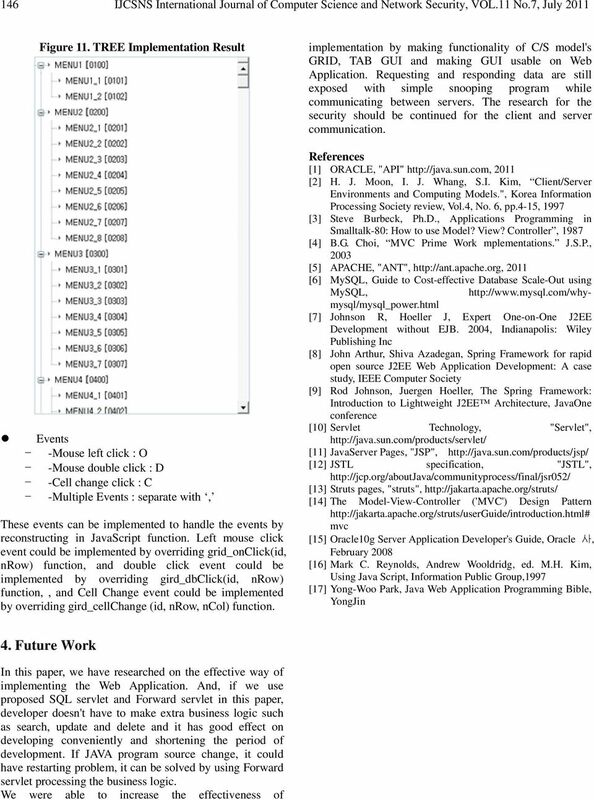 The compile process of this paper also uses ANT and it moves in lib directory to the WEB-INF directory after the compile process. 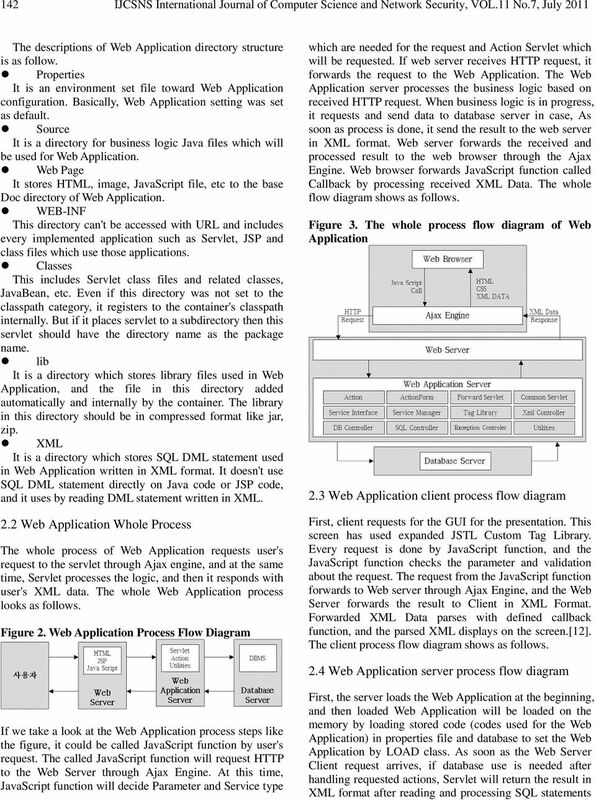 2.6 Web Application SQL Servlet Process Flow The proposed SQL Servlet is for only SQL service. It processes by reading XML document from the XML directory. It separates SQL ID (ID for SQL) by using delimiter to be able to handle multi SQL DML at the same 2.7 Web Application Forward Servlet Process Flow The proposed Forward Servlet in this paper is a servlet to process business logic in JSP. It is very effective for maintenance or change of implemented source. If it compiles when the source needed to change, web server need to be restarted. Because it could lead to service interruption, it forward the result in XML format after processing the JSP business logic which doesn't need to be compiled. A Guide to Understanding Web Application Development Corey Benson, SAS Institute, Inc., Cary, NC Robert Girardin, SAS Institute, Inc.
HttpUnit Laboratorio di Sistemi Software - A.A. 2003/2004 Introduction HttpUnit, available from http://www.httpunit.org, is an open source Java library for programmatically interacting with HTTP servers.